Poe’s “Annabel Lee” somehow manages to fit that definition, despite its traditional ballad-like form, and themes of love and death. How so? Well, depending on how one reads this poem it’s really downright creepy, and satisfyingly beautiful at the same time. 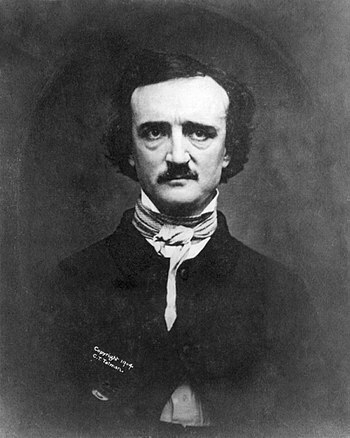 The photo we have of Poe here was taken in the year before his death which is the same year in which it is believed that he wrote “Annabel Lee.” Our friend, the poet, well he had a thing for both death and beauty. In fact, the two went hand in hand for him. It’s been speculated and debated time and again if poems like “Anabel Lee” were in fact based in reality. I can only say that the emotions of the poem seem real. Whether based on the tuberculous death of his young bride Virginia or not, the material for inspiration was certainly abundant in Poe’s life. And why not the death of a beautiful man? Or the death of a child, or a parent, or a beautiful idea? A beautiful and well-loved dog, or planet? Well, setting aside discussions of misogyny and sexism for the moment, I don’t want to be too hard on him, knowing that he, like most of us, was at least in part a product of his own experience, and projecting that experience onto the larger world is not uncommon. In fact, perhaps this is how we find universal meaning in the particulars. In any case, Poe had lost women in his life, mothers and lovers, figuratively and literally, in courtship and in death. It’s an interesting topic to research (as usual there are great sources in those links). I confess “Annabel Lee” is probably my favorite of the “Dead Bride” poems, with its archaic fairy tale-feel, young romantic love, celestial jealousies, tragedy and sense of the macabre. I remember in middle school wondering how literally we could take the lines at the end about lying down with his love in her sepulcher by the sea. Is it any wonder that Poe becomes popular with the emotional goth and emo kids? I think that he would be pleased though that much of why I find the poem so beautiful springs from the poem’s form. There is an excellent analysis of Poe’s technique in this work on KHarger.com. The rhyme, meter, repetition all build the framework for this particular version of his favorite theme, and Harger explicates it exceedingly well. I encourage you to read it. Poe, a champion of the “Art for art’s sake” creed, believed that poetry should be song-like in its aesthetics, and as such I suspect he would be tickled to hear how Stevie Nicks put his poem to music in her 2011 album In Your Dreams. He might be miffed about the dropping of one entire stanza, the poetic and specific term seraphim being dropped for the more general word “angels,” and the omission of the word chilling in the line “Chilling and killing my Annabel Lee.” But overall I think he would be in the audience, beaming with pride and applauding if he could see and hear Stevie in concert. In keeping with my tendencies to be a night owl, and since I have not yet gone to bed, and since I started this post well before the witching hour, it is still, in spirit at least, Thursday Poem territory. Often in a post like this I copy the the full text below the video, but to keep the formatting the way Poe intended it, and to point you toward a wonderful resource, click here for the full text of “Annabel Lee” at The Poetry Foundation. Stevie Nicks – Annabel Lee from Mister VJ on Vimeo. Is it part of our times , that she thought changing words here and there….was a good thing to do to improve on Poe..lol..? Besides , the whole strong rhythm , vital to the poem..is completely abandoned and lost here. That’s my 2 cent worth anyway…but thanks for posting David. Was interesting to realise, once again..the power of reading..! Yes, it’s very interesting, isn’t it, that much as I like her song, the addition of music does not make it more powerful than the original. And I hadn’t thought of what you said about the “strong rhythm” of the poem being lost here. It feels more in a minor key than the original doesn’t it? Still, though I don’t like it as well as the poem, I think I like it because I like both Nicks and Poe, and I’m thrilled that someone has put him to music in modern rock. Thanks for your insight, dear! I could so see you dressed as Stevie Nicks! And thanks for these insights into Poe’s influence on Keats! Excellent. As for the hit, I am honored to have been your poetry dealer once again this morning. So, is it still true that there are more poems to sublime dead women than to any other topic? How perfect we are until, not perfect and so we die and rebecome perfect. my wholly mine, Annabel Lee. So yes, lovely… and at the same time, bah! ah the anguish. sorry, get the creepy horror, love the gothed out stevie, and still… isn’t there just a bit of the obsessed stalker about this? Yes, that’s always troubled me too. Same with the Highway Man by Alfred Noyes, and Lady of Shallot by Tennyson. I love the poems, but I think they say more about the plight of women in early to late Victorian times. Actually, Lady of Shallot was 1832, I think, the original publishing. Then came this one by Poe in 1849 and last was The Highwayman by 1906. . . Health issues? Tuberculosis and such, combined with the stalker nature of certain genius poets? Wow, I imagine an English professor getting very uptight right now reading this. But yes, there is something about this theme that is just horrendous, and makes one wish men obsessed over something more than war and objectifying women’s beauty. I know, I know, the young noble men reading this are probably thinking of a higher form of love, but maybe I’m older and cynical. Having said all of that, yeah, I still like these poems, particularly the Lady of Shallot, of which I wrote a paper once regarding what Tennyson seems to be telling us about Victorian women and the trap their men had them in. Wow! Poe reading my blog? That would be awesome, but I imagine he would, like Whitman, mostly be looking for mentions of his name. 😉 Thanks, Gina! I appreciate your comments so much. Nice! And I need those sunny greetings. We’ve warmed up to minus 9° F here. It was -13. Thanks for all the blog love this morning! I think Stevie pays Mr. Poe the highest of compliments by taking his words and giving them a new, different life (though, I’m sure there are those who find the idea horrifying)! I think if the Annabelle Lee music was this sad and moody, it would be a much better song … but, that’s just me. someone. It makes me think tornado rather than tuberculosis. But I’m also sure that I’m being overly fussy. As for the mood of the song, you may be right. I’ve been intrigued by the Lumineers, and Fun and other groups lately, dealing with sad songs in major keys. Interesting. But it may not always work. I think I was so taken with this simply because it was Stevie bringing to life Poe… heck anybody putting Poe to music, but I especially Stevie. That just made me ecstatic. So I might be a very biased judge. Your points are very good and wel, taken, as always, John.